Archives :: The Union exists to promote golf in the County and to provide competition for the top county players as a route to Midland and International golf. Staffordshire U16 Boys 9.5 Derbyshire U16 Boys 5.5. Full results to be found under Juniors - U16 Results. Many thanks to Onneley for taking this match at short notice. Staffordshire U16 Boys 6.5 Cheshire U16 Boys 3.5 in singles only match. Full results to be found under Juniors - U16 Results. Another good win by 9.5 - 5.5 for the Staffordshire Boys at a very well presented Beau Desert GC. Full results under Juniors - U18 Results. This Mixed Age Group match of 4 x U18, 4 X U16, & 4 x U14's showed Matchplay golf at its finest. Despite loosing the morning Foursomes 1 - 5, the Staffordshire boys fought back in the afternoon singles to win them by 7 - 5. Overall result a win for Cheshire by 10 - 8. Details on the Junior resuls page under U18's results. 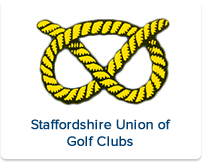 Staffs Boys U12 & U14 Championship at Wergs GC 24th July. Congratulations to U12 Champion Harvey Roberts (Beau Desert GC) with a gross 80 and U14 Champion Ethan Ives (Great Barr GC) who also scored gross 80. A win for Staffs by 9.5-8.5 points. Congratulations to Boys Captain George Clarke and the boys who were successful in winning the Four Counties Tournament held at Walmley GC. Played over two days, the boys beat Warwickshire, Gloucestershire and Worcestershire. Pictured above L-R Jim Whitehouse (SUGC Past President), Alex Chapman, Tom Beasley, Ollie Read, Jack Smith, Charles Birchall (U18 Manager), George Clarke, James Wilkes, Ellis Muckley, Will Downes and Roger Waite (SUGC Past President).